The pins needed for basic control of stepper motor are used when other pins are used in engraving machines or 3D printers. Here we do not elaborate, IO corresponds to above. 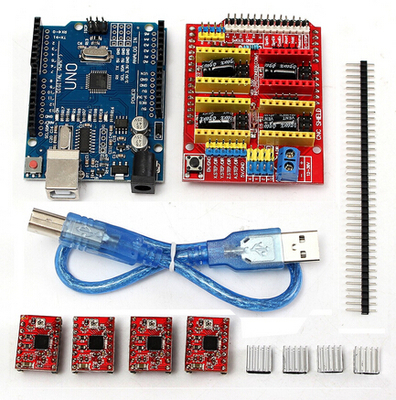 / / function: step function: stepper motor control direction, the number of steps. Step (true, X_DIR, X_STP, 200); the //X axis motor is turning 1 laps, and the 200 step is one circle. Step (true, Y_DIR, Y_STP, 200); the //y axis motor is turning 1 laps, and the 200 step is one circle. Step (true, Z_DIR, Z_STP, 200); the //z axis motor is turning 1 laps, and the 200 step is one circle. Experimental phenomenon: the step motor reverses one circle, pause for 1 second, and then passes a circle, so cycle. 2A, 2B is a group of (red, green), 1A, and 1B as a group (blue, yellow) want to change direction, change the location of one of the groups, such as 2A, and 2B exchange.